Apple TV can wirelessly synchronize with iTunes libraries and connect to your television and stereo system. You can transfer iTunes movies and videos (and other content) to your Apple TV. Videos you have purchased will show up in "Movies" on your Apple TV. This way, you don't have to watch your iTunes purchases on your computer — you don't even have to have your computer turned on at all. Unfortunately, Apple has not made playing of rented movies that easy. Of course, you can rent a movie directly from the iTunes Store on Apple TV. However, movies rented on your Apple TV are not transferable to any other device and can only be viewed on your Apple TV. And for iTunes rentals, it's also inconvenient due to rental expiration and viewing limits. How to play iTunes rentals on Apple TV? Is it possible to keep iTunes rentals forever? M4VGear DRM Media Converter will be greatly helpful for you to remove DRM from both iTunes purchased and rentals. 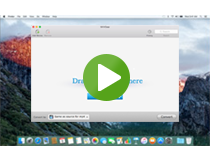 After removing DRM, you can keep iTunes rentals and watch them without any limitation. After conversion, it's also easy to play iTunes rentals on Apple TV. What's more, you can also transfer the DRM-free videos to any Android or Windows device for viewing. Double clicks to launch M4VGear and click on the "Add Movies" button on the upper left. There will pop up iTunes library showing all the movies, TV shows and other M4V videos you purchased or rented from iTunes. Choose the videos you want to convert and click "OK". On the bottom right, you can change output format to the one you prefer. Or, it would be directly converted to Lossless MP4 format. Meanwhile, here you can also manually change output directory in the pop out setting Window. Press "Convert" button on the bottom right to unlock DRM from iTunes videos and convert them to DRM-free MP4 videos. The selected videos will be converted one by one automatically. Do not control iTunes during conversion in case that some error may happen. 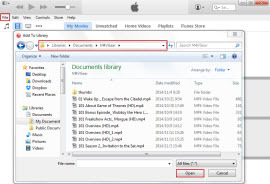 Launch iTunes, click menu bar File > Add to Library to import the converted non-DRM files to iTunes library. Then click File > Home Sharing > Turn On Home Sharing. 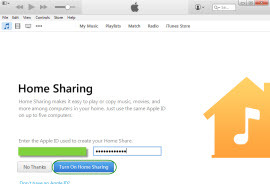 Enter the Apple ID and password for the iTunes Store and click Turn on Home Sharing. 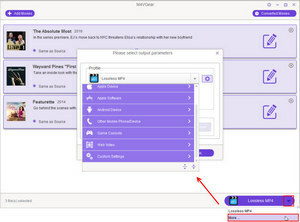 After you turn on Home Sharing, Apple TV will automatically find iTunes libraries on your home network and are use the account name you entered. The shared libraries will appear in Computers on the main menu of Apple TV. Tips: M4VGear will offer you a 1 minute free trial which will let you convert one minute of iTunes purchases and rentals for free. If you want to unlock the time limitation, please purchase M4VGear with $44.95 ($49.95). Rent or Buy Movie from iTunes, Which Would You Choose to? How to watch iTunes Extras on Apple TV?